I am such a sucker. No really, every time The Perfect Brownie commercial comes on TV I tell myself I'm going to but one next time I'm at Bed Bath & Beyond (they have an entire "As Seen on TV" section!). 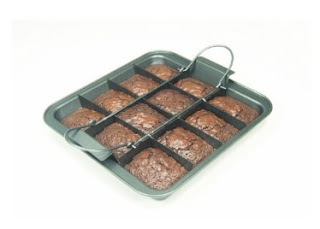 And now it's been over a year since I first said that and my kitchen still lacks the Perfect Brownie pan. It's not as if I am incapable of cutting brownies the old fashioned way, but I LOVE that every brownie comes out perfectly even and each has that coveted crispy edge! And unlike most gimmicks, I know this works because I bought one for my mom and mother-in-law for Christmas last year and they both love it! I have endless ideas for the pan, such as: individual blondies, Rice Krispie treats, lemon bars, carrot cakes and so much more! Plus, you can decorate each one seperately. So fun! Are there any silly gadgets you wish you could bring yourself to splurge on? i love gadgets! this one looks amazing - you're right, the possibilities are endless! and it already portion sizes things out for you! i've had my eye on the auto vent on the ASOTV store - to get for Robbie. It's so hot in vegas i almost melt every time i get in his car!